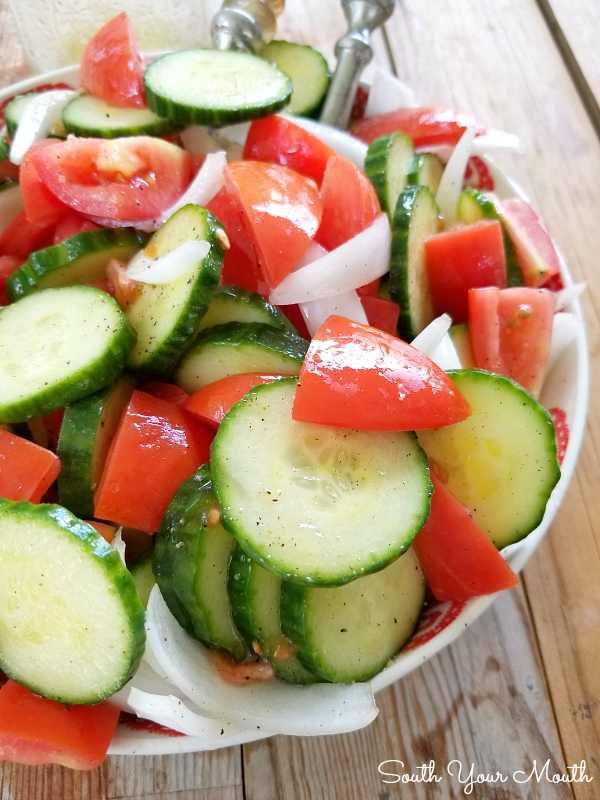 A simple recipe for a perfect summer salad made with cucumbers, tomatoes, onions and an easy oil and vinegar dressing. Mama always kept a little garden with cucumbers, tomatoes, squash, zucchini, peppers (hot, sweet, REALLY HOT, etc.) and strawberries in the summer. Between that and the field peas that grew wild at the edge of the field between our and Nanny’s house, we could always get something fresh for supper. 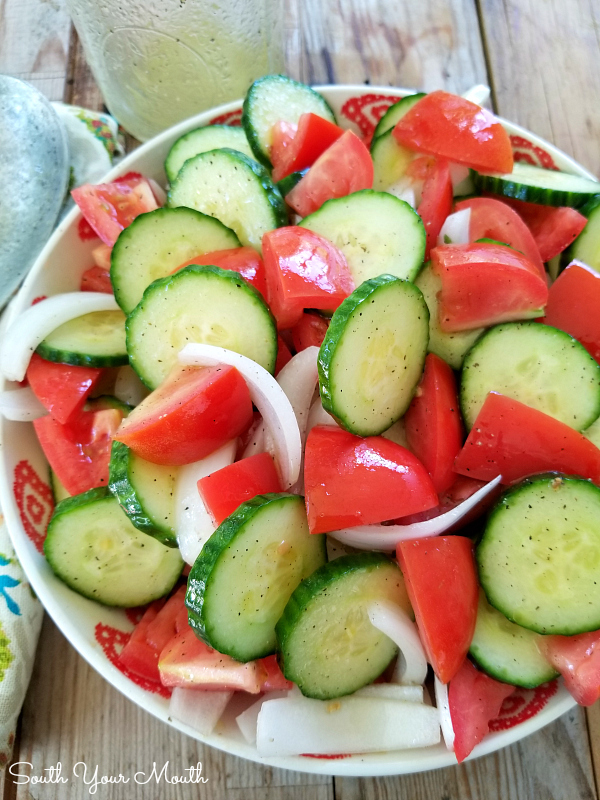 As a kid, I never got too excited about the squash, zucchini or peppers (though I sure would now) but I always looked forward to field peas and rice, strawberry ANYTHING and fresh sliced cucumbers and tomatoes. I’m pretty sure there weren’t too many summertime suppers at my house that didn’t have a bowl of cucumbers and/or tomatoes sliced up ready to eat. 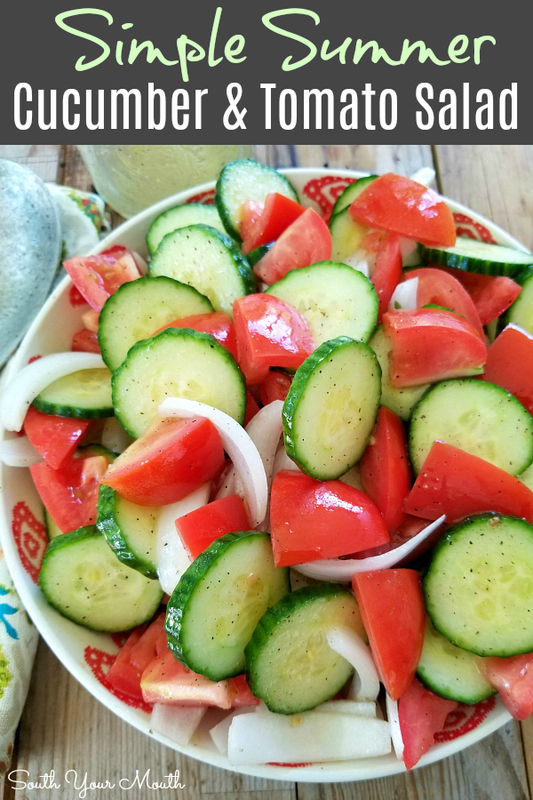 Most times we just ate them plain but sometimes we’d have the cucumbers with a splash of white vinegar on them or the tomatoes with a little Italian dressing. 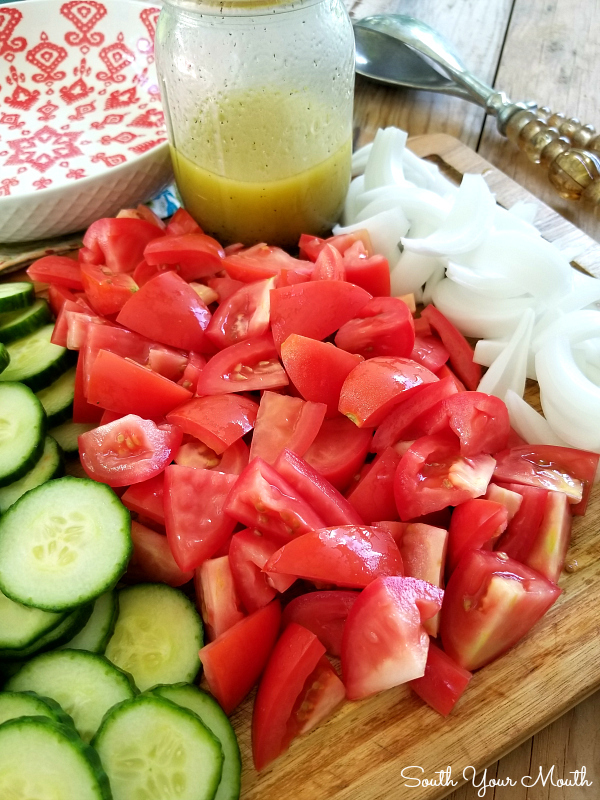 These days my favorite way to make them is to whip up this easy vinaigrette and make a simple salad of cucumbers, tomatoes and onions. 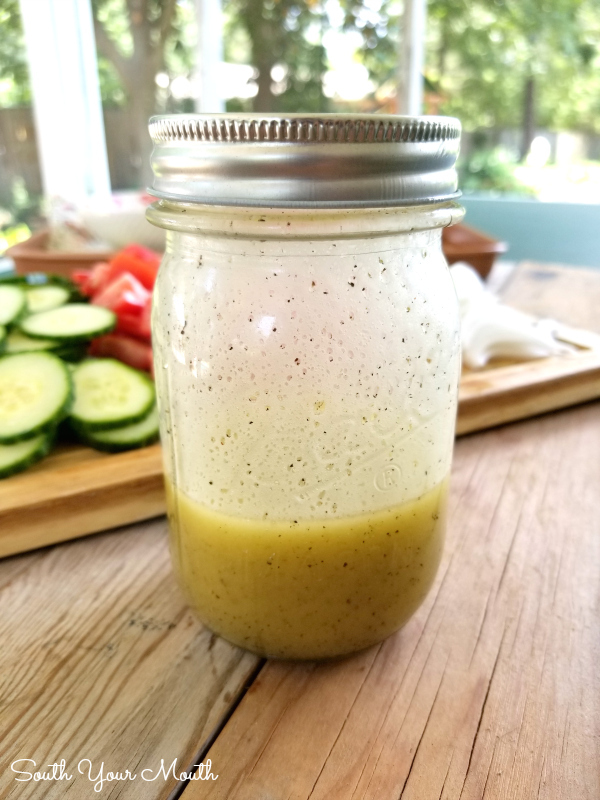 This dressing is very mild and doesn’t overpower the taste of the fresh veggies. I love to make a big batch of it and keep it on-hand for salads and to have as a quick marinade for chicken. You can toss some chicken pieces in a bowl with the dressing, let it marinate for a few hours then grill it up for a super-quick, easy and DELICIOUS weeknight meal (seriously so perfect in the summer!). Since I make the dressing without any herbs or spices (other than salt, pepper and sugar) I often add garlic and rosemary to it when I’m marinating chicken. You can really dress this vinaigrette up with whichever herbs and spices you prefer. It’s just a great, simple, basic dressing that you can make your own. Sometimes I use plain vegetable oil (usually canola oil at my house), sometimes I use olive oil and sometimes I use a combination of the two. Olive oil certainly has a stronger flavor than other oils so take that into consideration when you’re making yours. Stewed Beef & Rice - Beef tips slow-cooked until tender with a rich gravy served over rice. Oven Barbequed Chicken - A recipe for oven-baked chicken cooked low-and-slow that tastes like it came right off the grill. 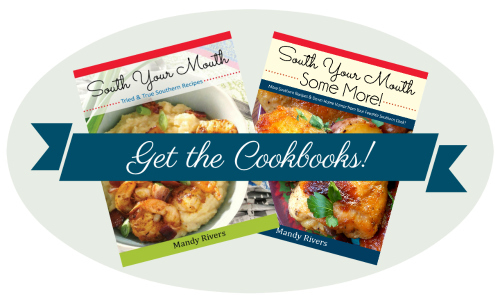 Fried Pork Chops & Country Gravy - A Southern-style recipe for country fried pork chops with velvety homemade pan gravy. Hamburger Steaks with Brown Gravy - The BEST recipe for Hamburger Steaks with easy, homemade brown gravy. Chicken Parmesan - Crispy chicken cutlets topped with gooey melted mozzarella and marinara sauce. Classic Stuffed Shells - Italian sausage, ground beef, spinach, garlic and herbs stuffed in jumbo shells then topped with sauce and cheese! Pasta with Bolognese - A rich Italian meat sauce made with beef and pork with layers of flavor perfect over pasta. Italian Sausage & Pasta with Tomato Cream Sauce - A creamy pasta dish with Italian sausage, cream and tomatoes. Classic Lasagna - An easy recipe for classic lasagna using prepared sauce and traditional ingredients. Wash cucumbers and tomatoes then cut into bite-sized pieces (feel free to peel the cucumbers if you prefer); add to a bowl. Cut onion then add to the cucumbers and tomatoes. Toss with vinaigrette to serve. Combine all ingredients then whisk rapidly or add to a lidded jar then shake vigorously. If I’ve got them, I prefer to use pickling cucumbers but I can’t always find them (and sadly, I don’t have my own garden). I don’t usually peel English cucumbers but I do for all other varieties. Use whichever tomatoes you like! I had a pile of romas when I made this batch so that’s how I wrote the recipe. Use red, white, yellow, Vidalia, etc. onions. Use whichever you prefer! I rarely make this with all olive oil unless I’m serving the salad with Italian food (because the flavor can be a bit strong). I typically use half canola oil and half olive oil or I use all canola oil. Feel free to add any herbs or spices you like to the vinaigrette! This is just my basic recipe. 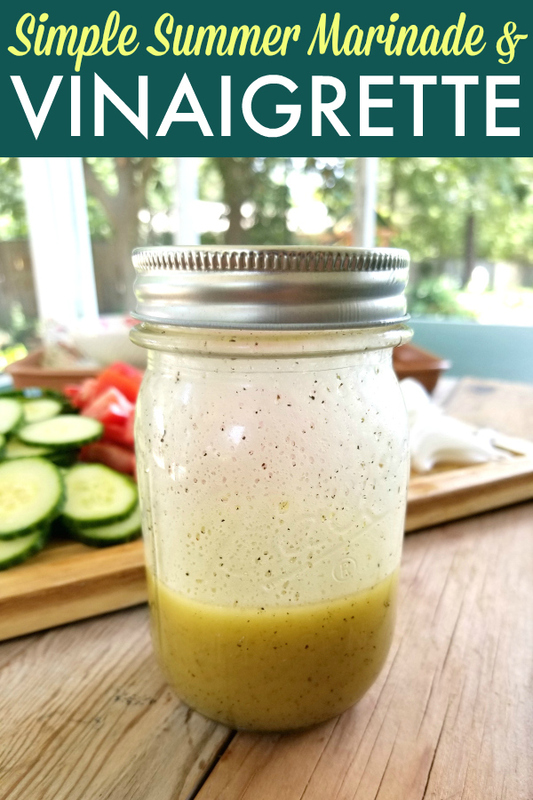 This vinaigrette makes an AWESOME marinade for chicken! Especially if you add a little garlic and rosemary. Yum! Thanks for sharing the dressing recipe! I love this combo in the summer!